We are still in a period of headline risk in financial markets generally. Stocks, bonds and currencies are all reacting to news on subjects as diverse as trade, North Korea, and Italian politics. Neither Italian political turmoil nor an on again, off again relationship with North Korea are anything new, but the prospect of an escalating trade war has traders in every market worried. The bond and currency markets are reacting as you might expect, with the U.S. 10 Year yield falling and the Dollar gaining ground as the “risk-off” trade gathers pace. Both have seen a bounce off obvious levels, 95 for the Dollar Index and 2.75 for 10 Year yields, but for now the trends remain intact. 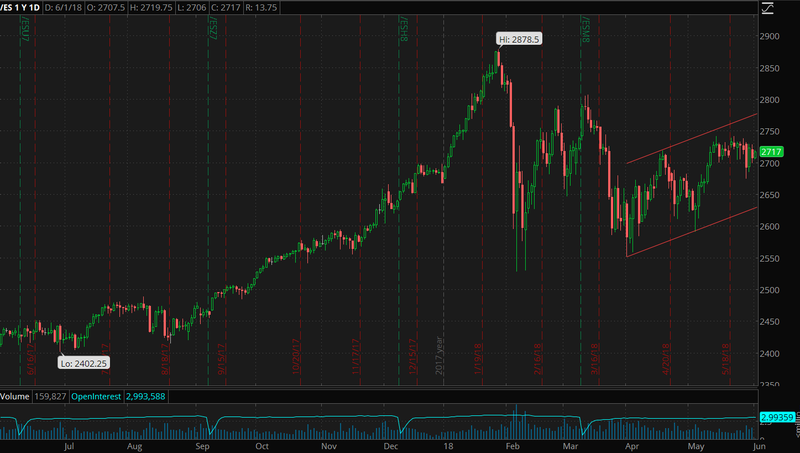 Stocks are a different story. U.S. equities are holding up remarkably well and remain close to the top of an upward recovery channel that has been in place since April. The feeling seems to be that healthy corporate profits and reasonably strong economic data trump (if you’ll forgive the pun) the headline risks. As always, geopolitical risk as it relates to oil is focused on the Middle East. The Trump administration seems to have picked a side in the ongoing conflict between Saudi Arabia and Iran, increasing the risk of the proxy wars between the two rivals in Yemen and Syria growing into full-blown open warfare. However, with the Saudis now getting U.S. support they will probably be content to wait and see the effects of renewed U.S. sanctions and, as this article at foreignpolicy.com posits, that also makes aggression from Iran far less likely. All in all, more simmering looks more likely than a full blow-up so the upward pressure on oil that we have seen recently from the Middle East will fade into the background for a while. The situation in Europe brings on a sense of déjà vu. It is eerily reminiscent of 2012, when the many announcements of the death of the European Union were somewhat premature. There is some risk here, but history suggests that this too shall pass. At the same time, six weeks of gains in the North American rig count and the conventional wisdom that U.S. and Canadian production are being, or will be, ramped up to compensate for reduced global supply. In reality though, the rig count steadied last week after six weeks of gains and the EIA numbers showed a larger than expected draw on inventories. The potential effects of a trade war loom large. The effectiveness of the OPEC led production cuts has been magnified by the improving prospects for global growth, and that is now at risk. However, this too comes under the category of headline risk. Consistency has not been a hallmark of the Trump administration so far, and there have already been several changes of tone of the tariff issue. Another could easily prompt a quick reversal in oil. 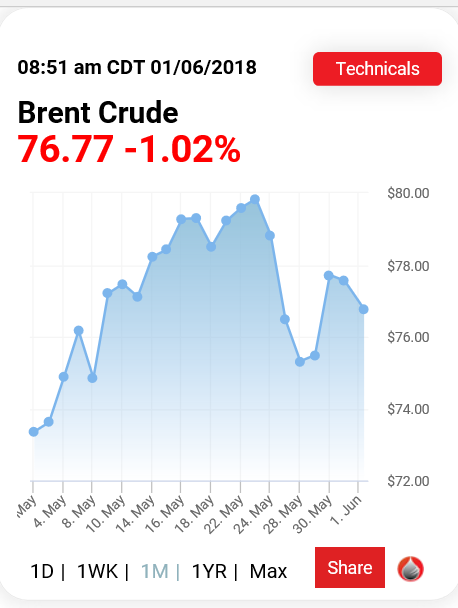 Brent, on the other hand, having failed to break $80 looks set to challenge $75 on the downside with no obvious support after that until $72.50 and multiple resistance levels just above the current price. Given that, today’s drop looks like the start of a third wave in an Elliott pattern, so everything points to lower. The Brent/WTI spread widening trade has been a popular one for a while but looks to be reversing. The fundamental factors that have supported Brent to some extent as WTI has corrected look fully priced in at this point, while a technical bounce in WTI is expected. Positioning for a narrowing of the spread therefore looks like a decent trade. 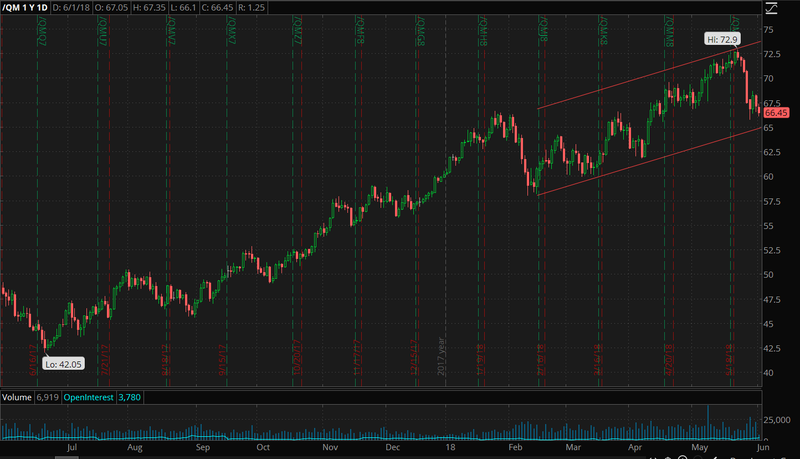 For those focused solely on WTI, the set up for a long is extremely tempting. The proximity to the base of the channel allows for a logical stop, or even reversal level around $64.50 while a Fibonacci based 61.8% retracement would take us back above $70. On balance I prefer the WTI trade with its beneficial risk/reward ratio. The world is heading toward another oil crisis. Too little investment and a demand that keeps increasing .